If it seems like the year of the iCloud utility, you’re not mistaken. Another entrant in the field is Cooking Robot’s Plain Cloud 1.0. This utility’s goal is to give you more transparent access to all the information that apps store in iCloud. 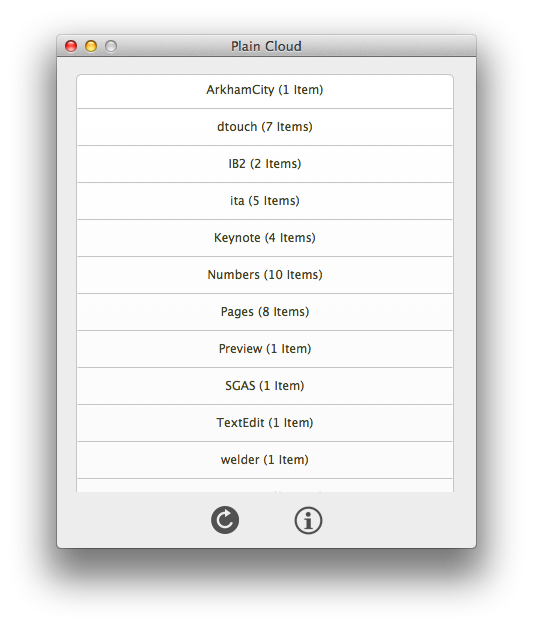 Plain Cloud accomplishes that task simply: Launch the app and it provides you with a list of apps that are using space in iCloud, along with how many items are stored in them. Click on any of them and you’ll be taken to a Finder folder window showing you the files associated with that application. While it works well enough for its stated purpose, Plain Cloud doesn’t offer anything in the way of embellishments. There’s a refresh button that, as you might expect, reloads the list of apps and the number of files they contain and an info button that just takes you to the app’s Web page. The names presented in the menu aren’t always the most useful either, since they sometimes pull from app’s internal information—for example, I had no idea what the app listed as “dtouch” was until I opened it up and realized it was the Daedalus Touch text editor on iOS. Plain Cloud’s utility could be handy if you’re trying to dig up a file that you fear you may have otherwise lost, but oftentimes the files that it displays are ones that you shouldn’t be mucking about with directly. However, if you need access to your iCloud files and you don’t want to wade through piles of miscellaneous Finder folders, Plain Cloud might ease the process somewhat. Get access to your iCloud documents.